While Sapphire's flagship Nitro+ series goes for broke, the Pulse lineup focuses on value. 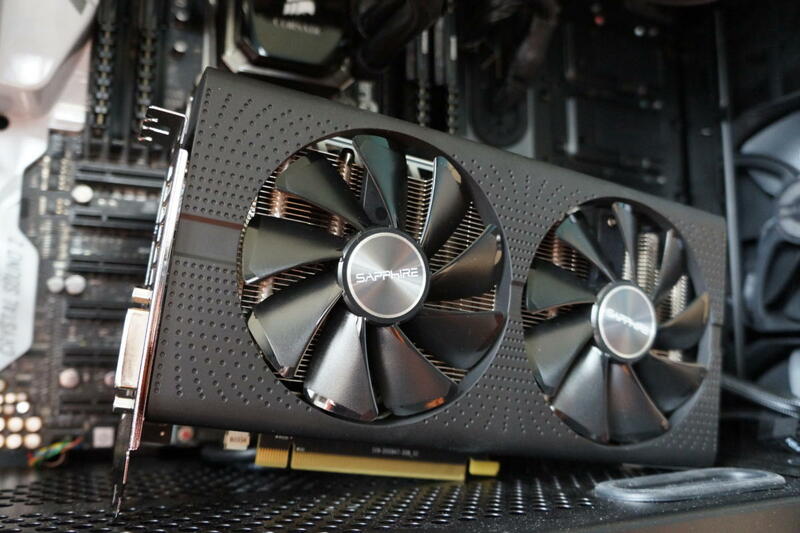 AMD’s new Radeon RX 500-series offers some of the best bang-for-buck graphics cards around, but so far, PCWorld’s reviews have mostly focused on custom versions with beefy coolers and premium prices, like the $300 Asus Strix RX 580 Top OC and $260 Sapphire RX 580 Nitro+. What if you’re looking to upgrade your PC while keeping costs as low as possible? Enter more budget-friendly models like Sapphire’s new Pulse series. The Pulse cards are designed to give gamers “great value for money,” according to Sapphire, and at prices just above AMD’s baseline MSRPs. There’s only one way to know whether that’s more than mere marketing fluff: taking it to the test bench. 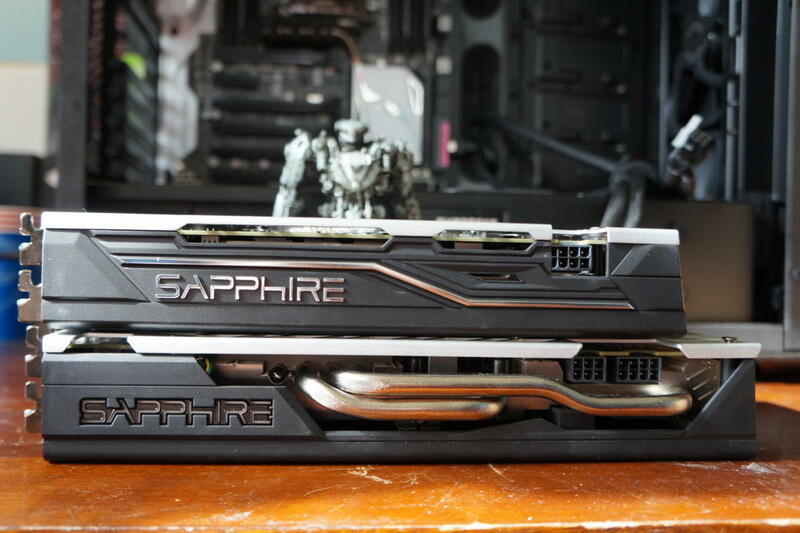 The Sapphire Pulse Dual-X cooler design. All of the cards match AMD’s baseline pricing, with the exception of the $180 RX 570 Pulse we’re testing today—RX 570 cards start at $170. But there’s a good reason for the premium: It packs Sapphire’s Dual-X custom cooler, just like the Radeon RX 580 Pulse cards. If you’re pinching pennies or have a tiny case, Sapphire also offers a $170 Mini-ITX 4GB RX 570 Pulse with a single-fan design and reference clock speeds. The Pulse cards we’re testing today include niceties not often found in budget models—and they’re visually identical. Both feature Sapphire’s Dual-X cooling solution with Quick Connect fans, and the same classy, perforated, black plastic shroud as Sapphire’s recent Nitro cards. The cards also rock a silver and black aluminum backplate, shot through with red pulse lines that play to the series name. Under the hood, the cards pack features like Sapphire’s black diamond chokes, precision fan control that allows the card to more accurately hit its designated RPM speeds, and the ability to shut off those fans completely when you aren’t stressing the GPU. The port configuration on the two cards is also the same. Both the Sapphire RX 570 Pulse and 8GB RX 580 Pulse rock dual DisplayPorts, dual HDMI ports (which is good for virtual-reality users), and DVI. 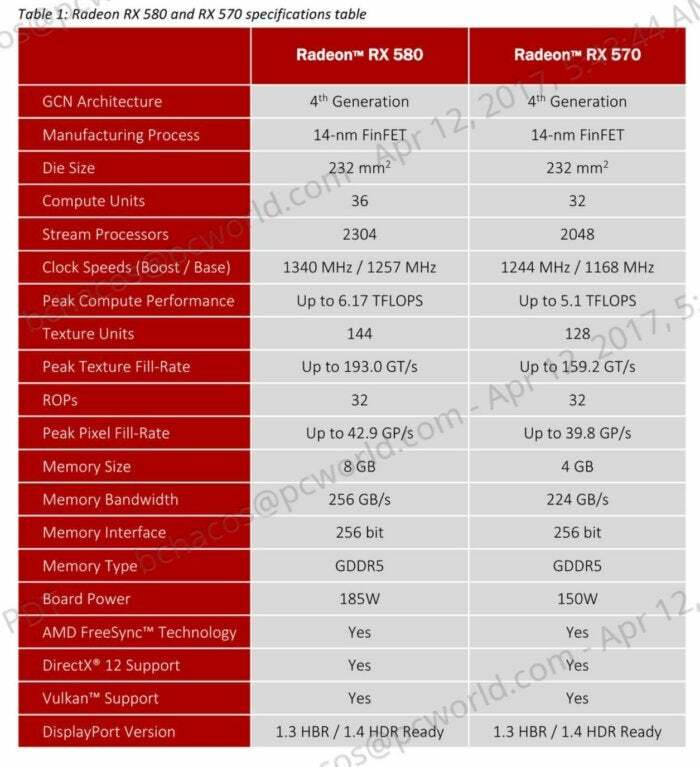 Reference specs for the Radeon RX 570 and RX 580. Performance isn’t identical though. The chart above shows the technical differences between the reference Radeon RX 570 and RX 580. 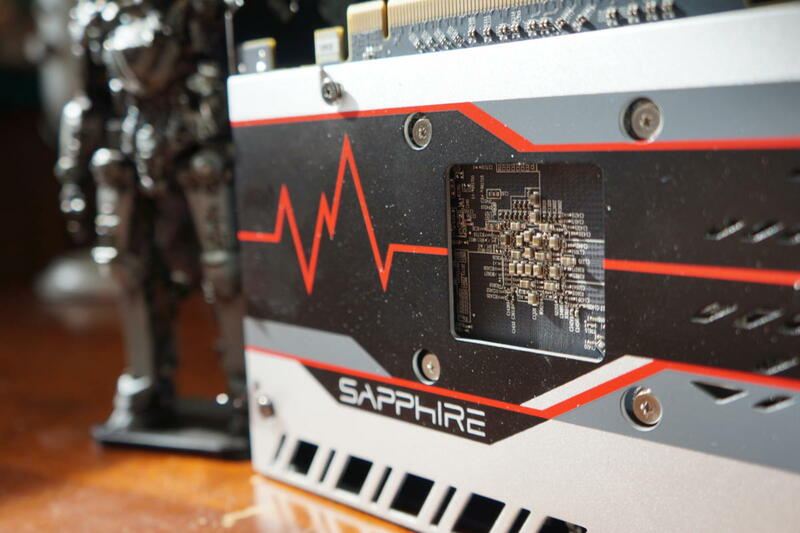 Sapphire used the extra cooling oomph to apply a 40MHz overclock to the RX 570 Pulse, which helps ease the sting of its $10 premium, and a 26MHz overclock to the RX 580 Pulse. They hit 1,284MHz and 1,366MHz, respectively. But now for the real question: How does Pulse compare to Sapphire’s flagship Nitro brand? It just so happens that I have a Nitro RX 580+ on hand. We’ll get in to performance in the coming pages but here’s a look at some key differences. The Sapphire RX 580 Pulse atop the Sapphire RX 580 Nitro+. You can see one difference immediately, and no, I’m not talking about the backplate design (for the record, I prefer the Nitro+’s aesthetic). The Nitro+ is both wide and longer than the RX 580 Pulse, to better accommodate the pricier model’s more robust cooling solution. 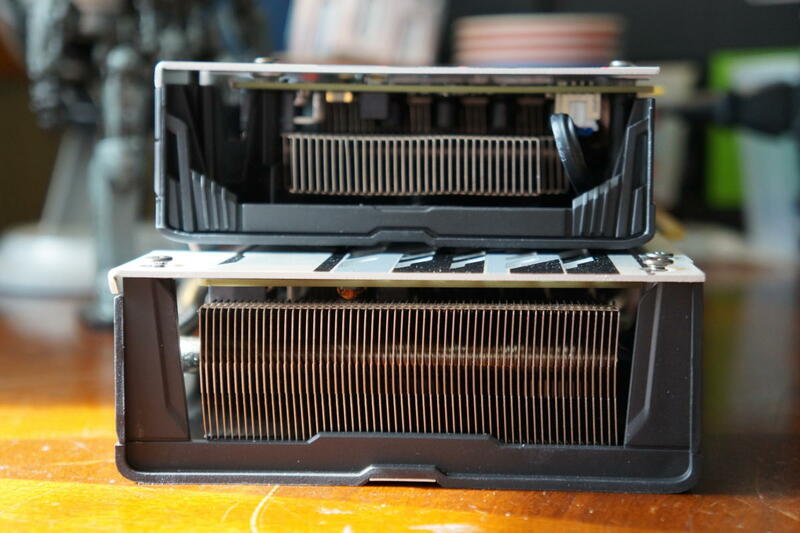 Heatsink comparison: Sapphire RX 580 Pulse (top) vs. Nitro+ (bottom). Taking a peek at the end of the cards reveals just how much larger the Nitro+ model’s heatsink is compared to the Pulse card’s. There’s no comparison. 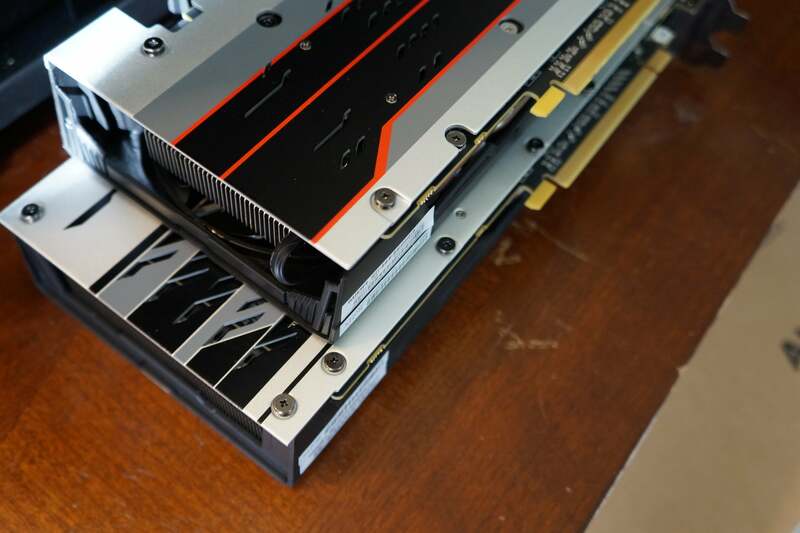 Likewise, examining the edge of the cards shows that the Nitro+ includes thick, snaking heat pipes while the Pulse does not. The edge of the cards reveals other key differences if you look closely. The Pulse’s Sapphire logo lacks the RGB illumination found on the Nitro+, for one thing. The pricier card also offers dual BIOSes and an optional 6-pin power connector, both of which can potentially be a boon for overclocking. Speaking of which, the Nitro+ offers a higher out-of-the-box overclock, at 1,411MHz vs. the RX 580 Pulse’s 1,366MHz. So you get a lot of extra features for your money with the Nitro+—but are the RX 570 and RX 580 Pulse, the stars of this review, still worthwhile? Let’s benchmark! Sapphire's 8GB RX 580 Pulse offers a decent overclock and a solid custom cooling solution for just $10 over AMD's baseline price. Definitely buy it over a reference card. Sapphire's Radeon RX 570 Pulse is a well-designed graphics card, but its price puts it in an awkward spot between cheaper RX 570 cards and the more potent Radeon RX 580.